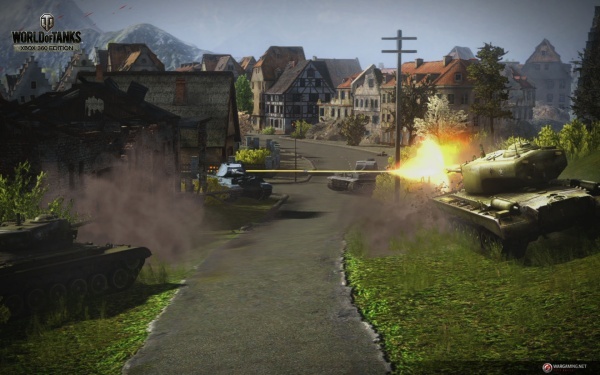 World of Tanks is a strictly multiplayer game in which two teams of fifteen players each do battle until either one team is eliminated (there's no such thing as a respawn here) or one team captures the other's base area by occupying it for a set amount of time. It would be nice if there was a little more variety in the available game modes, but the one included is enjoyable enough. The tanks are all based on real-world models from Germany, Great Britain, and the United States from roughly the 1920s through the end of the 1940s, and fall into one of five categories. Battle tanks come in light, medium, and heavy classes. Light tanks are scouts, fast and lightly armored, and their role is to spot enemy tanks for the bigger guns on the team to close in on and take out. Medium tanks are the workhorse tanks, ranging the battlefield looking to engage enemy tanks. Heavy tanks are the, well, tanks of the battle. Slow and heavily armored, but packing powerful cannon, they can both dish out and take a lot of punishment. Tank destroyers are the sniper class of the game. They are lightly armored and easily dispatched in a close quarters fight with a battle tank. However, they carry very powerful primary guns that are effective over a very long range. Tank destroyers should seek out high ground with some cover and lie in wait. When a target presents itself, a well-aimed shot or two can dispatch an enemy in short order. The final tank class is self-propelled artillery, and playing as artillery is a completely different experience from that of playing any other class of tank. Artillery must keep itself well out of harm's way - lightly armored, slow-moving, and unable to use direct fire, it's a fish in a barrel when facing any other tank. Used correctly, though, it's one of the more powerful assets on the battlefield. When aiming, artillery is given an overhead view of a portion of the map and can move that view across the entire map. The advantage of indirect fire is that you don't need line-of-sight to an enemy tank to fire on it - you can fire on enemies that can't see you and so can't fire back. To keep the game balanced artillery has an extremely long reload time, so playing artillery takes some patience. You need to scan the battlefield for enemy tanks and wait for them to hunker down for long enough for your shells to reach them. Tanks in each class are divided into ten tiers with Tier I tanks comprised of post-World War I peashooters and Tier X of end of World War II heavy hitters like the M48A1. Each player begins the game with a Tier I light tank from each nationality, and the game's matchmaking system is pretty fair when it comes to keeping every tank in the battle within a couple of tiers of each other. Unlocking higher level tanks requires first researching new "packages" for your current tanks, basically improvements to things like the engine or gun, after which you can research the base tank in the next tier along that tech tree. Researching upgrades is really a two-step process, with the research itself being funded by experience that you earn in battle and the actual purchase of the upgrade being paid for with silver. Experience is tied to the tank that you earned it with, so all of that time in an American tank won't help you unlock anything in the British tech tree. All players earn silver in battle just as they do experience, but silver can also be purchased with gold, which in turn is purchased with real-world money. While gamers willing to spend real money on the game may be able to keep more silver on hand, experience can not be purchased. The only way anyone can push their way to the high end of the tech tree is by fighting in (a lot of) battles. Now it is possible to use gold to purchase special tanks at higher tiers, but these tanks exist outside of the tech tree and are evolutionary dead-ends, so to speak. Silver is also used to repair your tank after a battle and resupply its ammunition, so there's effectively a silver tax for every match you play. You'll earn more in most matches than you'll pay afterwards, though. Silver can also be used to purchase special upgrades for your tank as well as consumable items to help keep your tank in a battle once it starts taking damage, and these purchases can certainly make a dent in your silver supply. There are also vanity purchases available such as fancy camouflage schemes which can be 'rented' for a period of time for silver or made permanent by spending gold. What this all comes down to is that it's completely possible for you to play the game for free and work your way towards a high-end tank, but those willing to spend a little money will get there faster. 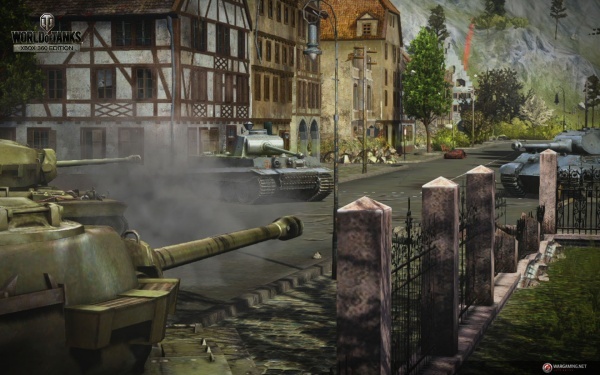 The game comes with a variety of maps that provide a good cross-section of World War II European battlefields. The North African desert, Italian mountains, French countryside, and Russian steppes are among the environments in which you'll do battle. My only complaint is that the maps are assigned at random and after you've already selected a tank class. A tank destroyer is a good choice on the steppes with the long uninterrupted site lines but can feel like a rolling death trap on the city streets of an industrial center. If you're knocked out of a battle early you can stick around and watch how it plays out, or bail out, pick another tank, and jump into another battle. You'll still earn the experience and silver that you have coming to you, but you won't be able to use the tank you lost until the battle ends. Leaving early also means that you'll miss out on the battle summary and stats screens, which is a little disappointing. I found World of Tanks to be a lot of fun to play. It's a unique game in a crowded genre, and I like the way that the lack of respawns makes you fight smart. The tank tech trees keep the game interesting by giving you a steady stream of new toys to try out, while also pushing you to fight in just one more battle to get those last few points you need to unlock the next tank. While the graphics certainly aren't on par with a Triple-A shooter, I have had more fun playing this game than I have with some other recent marquee shooter releases. Take the time to download the game and try it out. I'll bet that you'll be glad that you did. Final Rating: 82%. 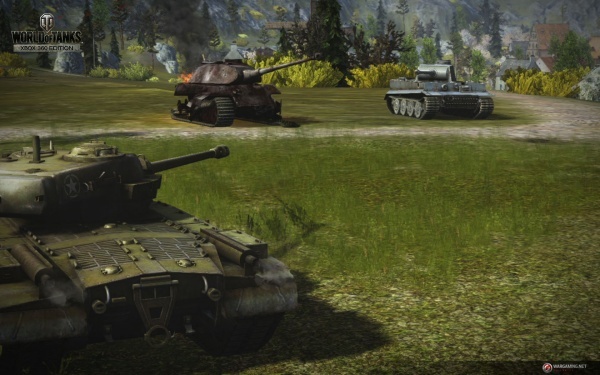 It's worth your time to take these tanks out for a test drive.